Estonia's "Monty Python and the Holy Grail"
The earliest history of what is now Estonia was written by a monk called Henry of Latvia. 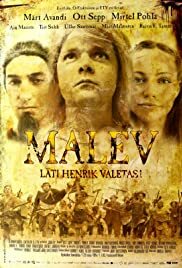 This film's subtitle is "Henry of Latvia Lied!" In the 13th century, German crusaders conquered Estonia and essentially ran the place from elegant manor houses until the collapse of the Russian Empire in 1917. This movie tells a very alternate -- and very funny -- version of how this came to be. There are, unfortunately for us outsiders, more than a few inside jokes. For instance, it helps to know that the people of Estonia's largest island, Saaremaa, are seen by mainlanders as pseudo-Scandinavian rustics with a sort of Muppets' Swedish Chef accent. Comic allusions to the European Union may fly over the heads of people not familiar with EU politics. It's also helpful to know that turning to Russia for help in the past has typically proved not to be such a bright idea. At the same time, I'm sure I don't need to explain why the French Knights Templar lust after Estonia's "natural resources" (swamp frogs). Or why the German knights all have little brush mustaches. Still, if you like loopy absurdist humor of the Monty Python variety, you can't help but get a kick out of this likable and surprisingly well-made film from a tiny and beautiful country on the northern edge of Europe.